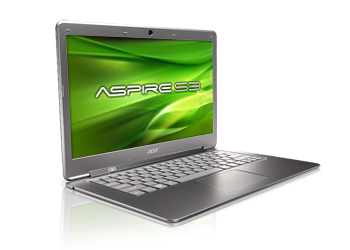 Acer Aspire S3-951-6432 is just 0.7-inch thick. This ultrabook comes with 13.3-inch high definition display, Intel HD graphics 3000, Intel Core i7-2637M dual-core processor, Intel UM67 express chipset, 4 GB DDR3 SDRAM, and 240 GB Solid State Drive. Aspire S3-951-6432 is equipped with 3-cell Lithium Ion (Li-Ion) 3260 mAh battery, web camera, 2-in-1 card reader (SD, MMC), HDMI port, two USB 2.0 ports, Bluetooth 4.0, and 802.11b/g/n WLAN.